Need a little sunshine on this dreary winter Thursday? 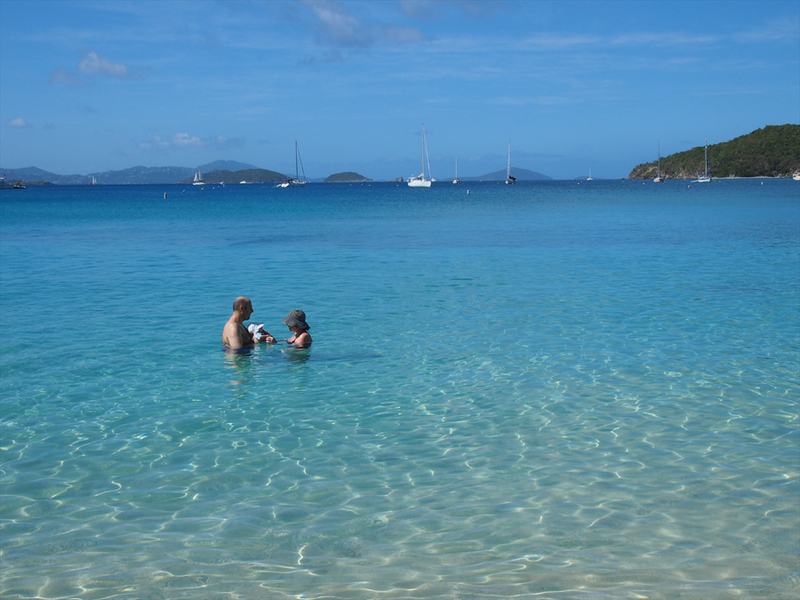 Check out these pictures from our recent trip to St. John USVI (U.S. Virgin Islands). Most of your phones will work there (check with your carrier). You don’t need to transfer your cash to a foreign currency. It’s a long trek from the West Coast, about two 5-hour flights each way. If you’re coming from the Midwest, South, or East, it’s obviously easier. You can even get a direct flight if you’re traveling from Atlanta or New York. 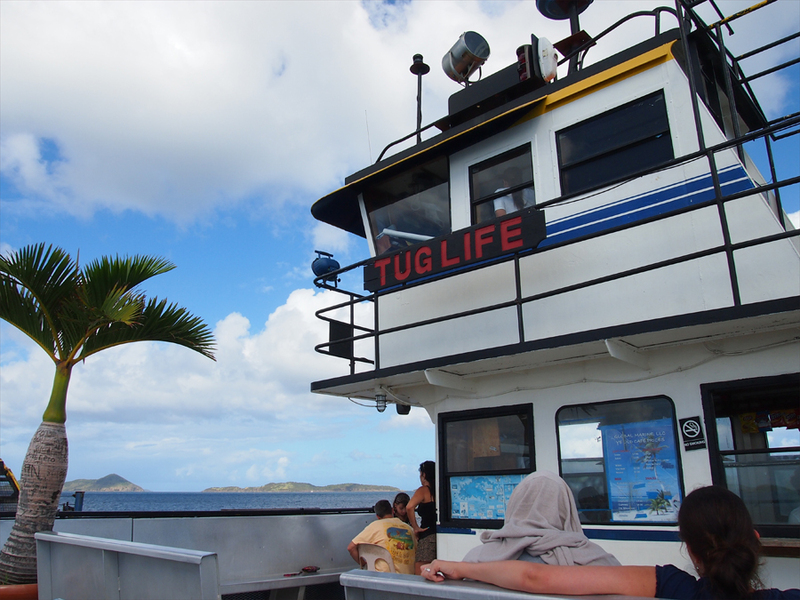 Once you arrive on St. Thomas, you’ll need to catch one of several ferries that service the nearby islands. Our villa management company directed us to the Red Hook ferry, which was a about a 20-minute drive from the airport, followed by a 15-minute boat ride. The ferries run pretty often, so we never had to wait much longer than 5 minutes. 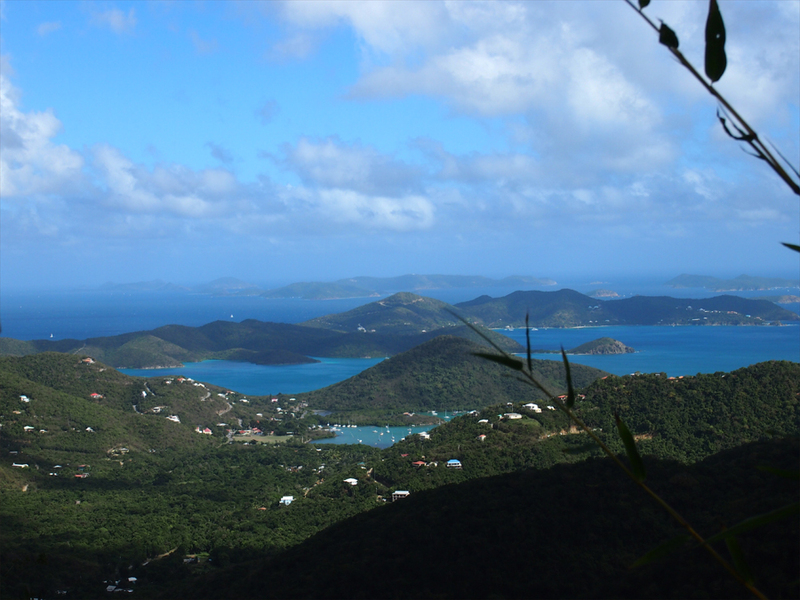 St. John only rents jeeps because the terrain is so steep and rugged. Since we had a larger party and needed transportation to the ferry anyway, we rented a car and mini van at the Budget in the St. Thomas airport. Definitely book online ahead of time, and even then, be prepared to wait 1-2 hours for your car. No. Really. There were a couple of other rental cars booths, all with no lines, but the Budget line was a circus. We even asked the Budget employees if it was always this way, and they said yes, on weekends. I’m not sure why. Could it be because they’re cheaper? Inept? 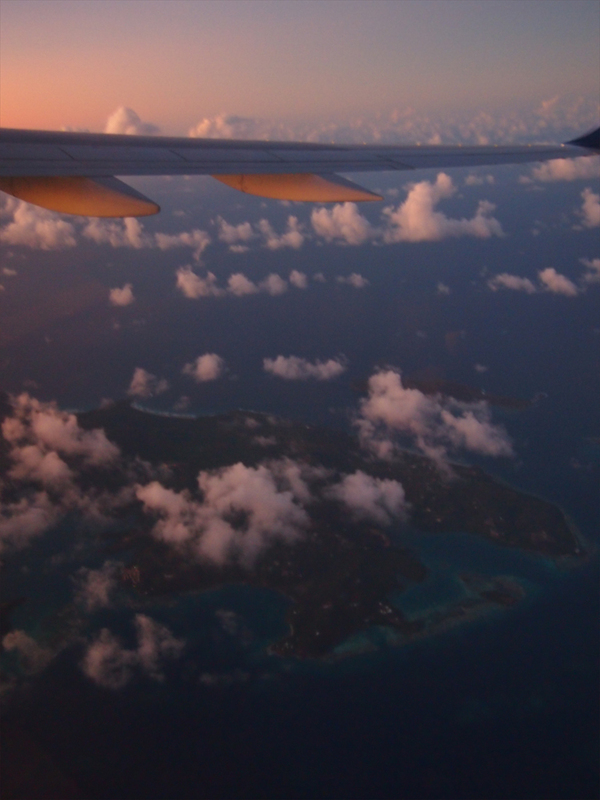 The only company that allows you to take rental cars to the other islands? I don’t know the answer to that. Just be aware. They drive on the left side of the road here, or as my travel-mates were prone to say “the wrong side.” It’s a quirky remnant of the island’s Danish past. However, the steering wheel is on the side you’re accustomed to, which made things even more confusing. I assume that’s because they import their cars from the U.S. Regardless, you’ll get used to it. Just follow what the other cars are doing and try to remember that the driver is sitting on the outside of the road. You’ll do fine. We rented someone’s vacation home, which I found on VRBO.com (Vacation Rentals by Owner). It was called Andante by the Sea and had three bedrooms, 3 baths, a pool, a hot tub, 180-degree views, three levels of decks (with beach chairs and a hammock), a fully stocked kitchen, and hospitable touches like beach gear and bath robes. I highly recommend it (and was not paid or otherwise reimbursed to do so). I’m sure there are several other rental houses on various different parts of the island that are equally as nice. There’s a big Westin Resort outside of Cruz Bay, but in my opinion, you kind of get a watered-down experience if you go to a big American hotel chain. But that’s just me. 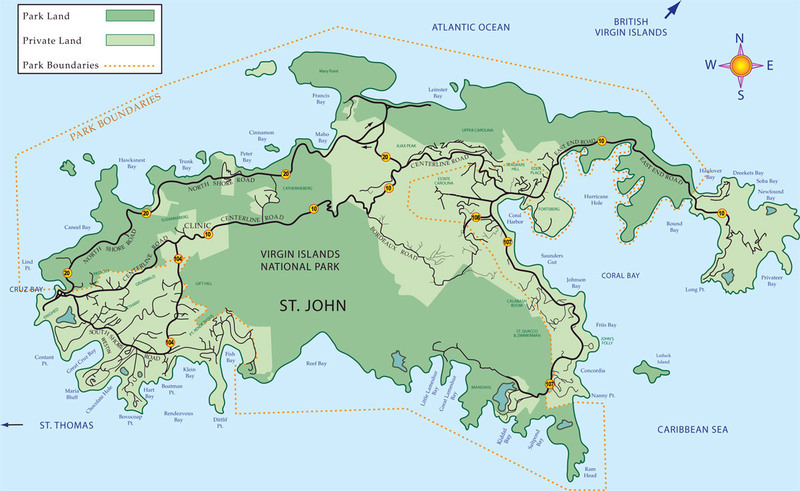 Once you arrive on St. John, stop into one of the souvenir shops and ask for a map. Or print one before you go. Our villa didn’t provide one, and the manager seemed surprised that we’d even need one. And I quote: “The island is so small. You’ll figure it out.” But the roads are windy, steep, and not well marked. So it’s kind of important. You really can’t go wrong with any of the beaches on this island, and you’d have to stay a long time to hit them all. 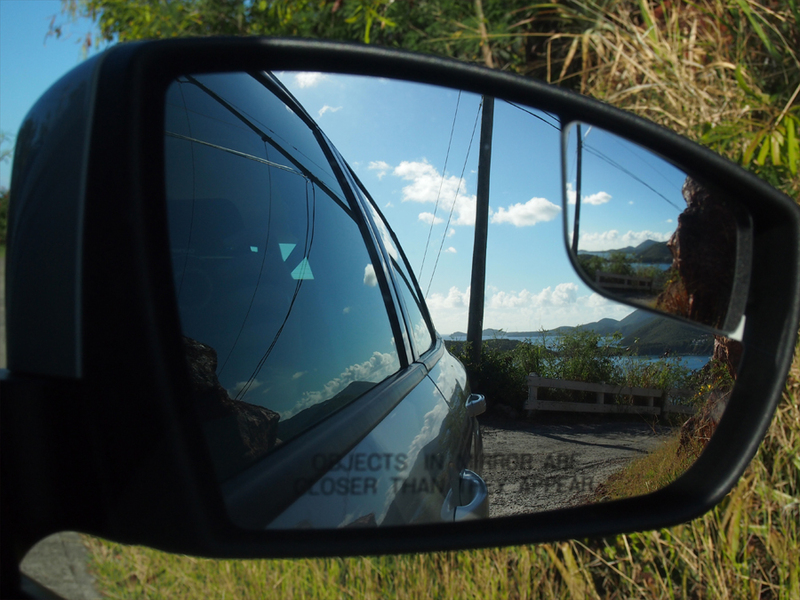 We visited three: Francis, Trunk, and Salt Pond. Several sea turtles occupy the far east coastline of the beach, which was obviously a treat for the snorkelers in our group, me included. 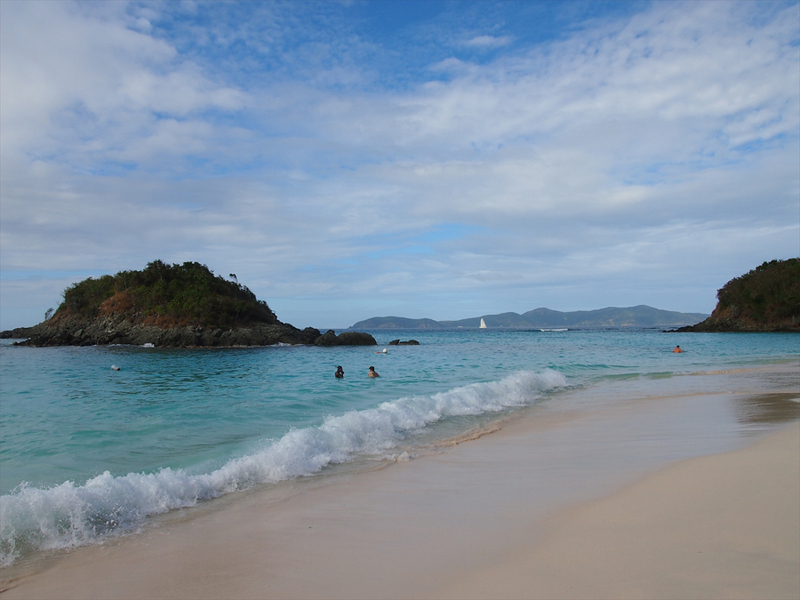 Trunk Bay is the most popular beach on the island, also on the north side. It’s where the cruise ship tour excursions go, so it’s busier, though not crowded by any means. The views are stunning, there are facilities (showers, bathrooms, and a snack/drink hut), and there’s an underwater snorkeling trail, complete with explanatory signs. The waves were pretty intense on the day we were there. 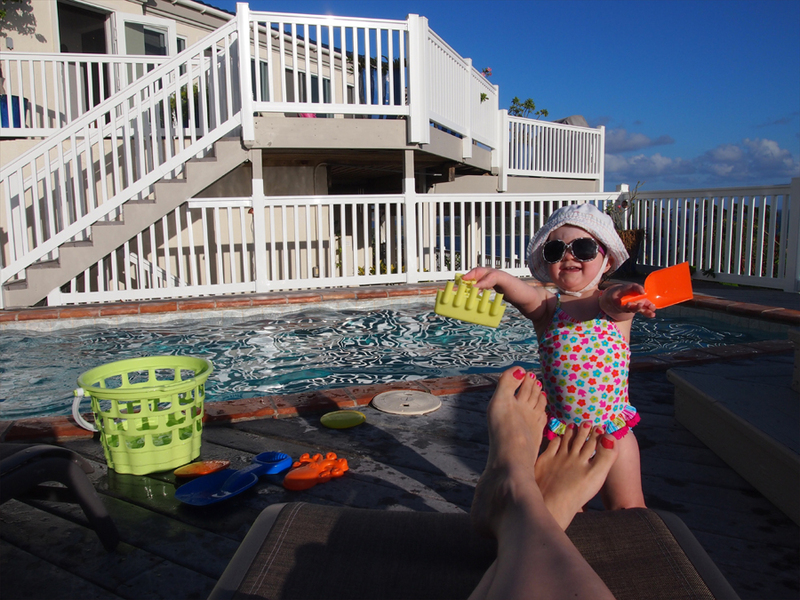 I don’t know if that was because of the time of year or a storm coming in, but it was a little harder to swim with the babies. 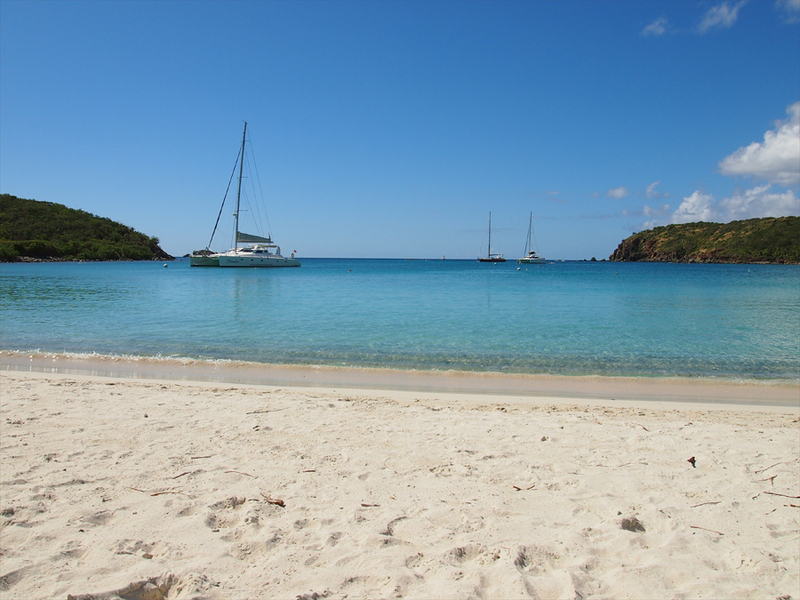 We also heard good things about two other north shore beaches: Cinnamon and Maho. Cinnamon had a sunken aircraft in the shallow part of the bay (pretty cool for snorkelers), and locals recommended Maho for the kids because its really shallow for a long way out. Salt Pond was on the southeast part of the island. It was more secluded and less populated, with a rugged quarter-mile trail leading down to the beach. It also had brilliantly clear water and white sand. We went there because a local told us it was good from snorkeling. We didn’t see much aquatic life while we were there, but when we arrived, some people told us they had just seen sea turtles, rays, and even an octopus. Perhaps maybe the high sun or an influx of sailboats parking in the harbor might have driven them away. If you want to snorkel there, I’d say go first thing in the morning to increase your chances of seeing the cool stuff. Either that or bring a kayak, so you can snorkel farther out and around the coastline, where the reef is supposed to start. We mostly cooked at home because we had a party of six adults plus three babies. Ocean Grill in Cruz Bay’s Mongoose Junction was nice because it was big enough for our group and didn’t require dinner reservations, like most of the restaurants on the island. Ocean Grill is particularly well known for their pastry chef, so save room for dessert. They also had live music, or at least they did on the Friday night that we were there. 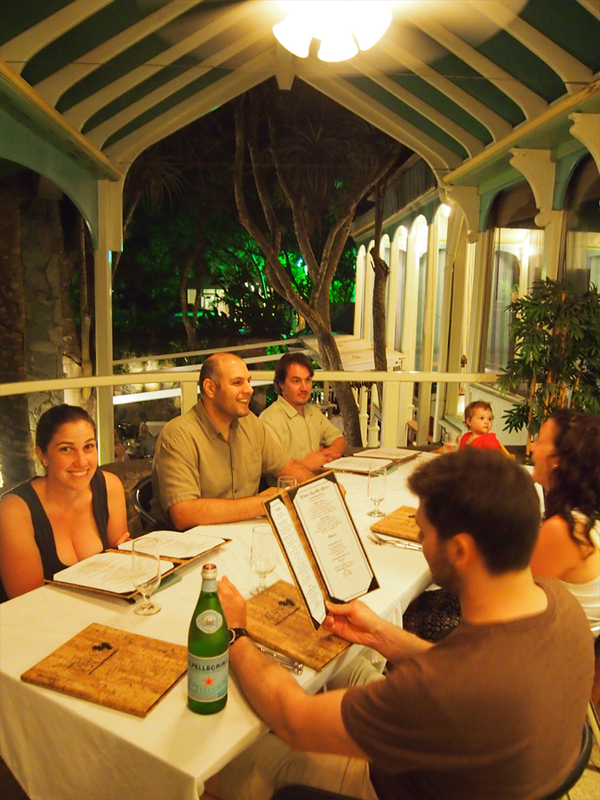 I really wanted to try Chateau Bordeaux, simply because of it’s amazing top-of-the-island view, but we found out too late that they’re only open for dinner mid-week (Tuesday, Wednesday, Thursday). That’s seems a bit ludicrous to me, but it’s their restaurant. They can obviously do whatever they want. 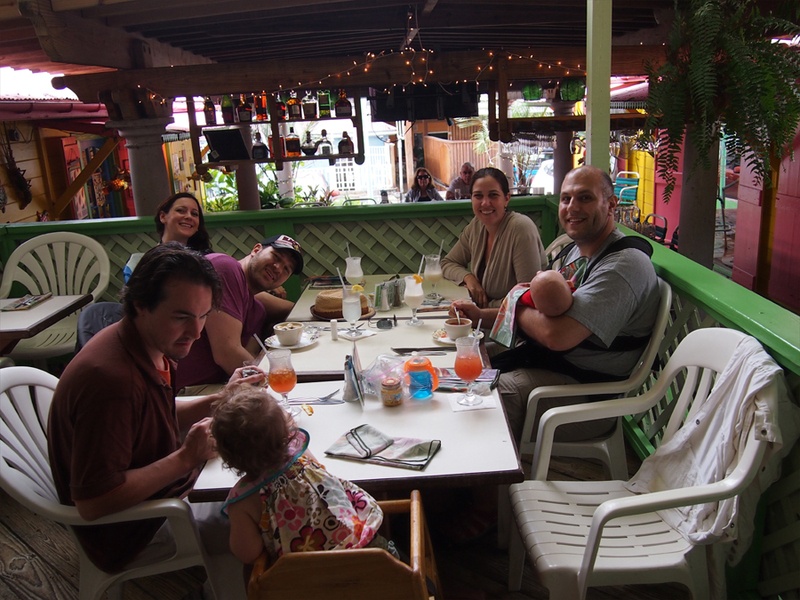 One rainy lunch we ate at the Lime Inn in Cruz Bay and were happy with their food and drinks. It didn’t have a view, but was colorful, friendly, and surrounded by some fun local shops. If you want a sunset view, we heard great things about Asolare and Zozo’s, but they were booked by the time we got around to making reservations. I’d suggest making reservations before you leave home or, at the very least, when you arrive on the island. There are also several outfits that will cater a dinner to your villa. Again, we tried to do this while we were there, and it was too late. You need to make arrangement for that sort of thing before you go. The people who owned our villa recommended Passion Fruit Chefs. 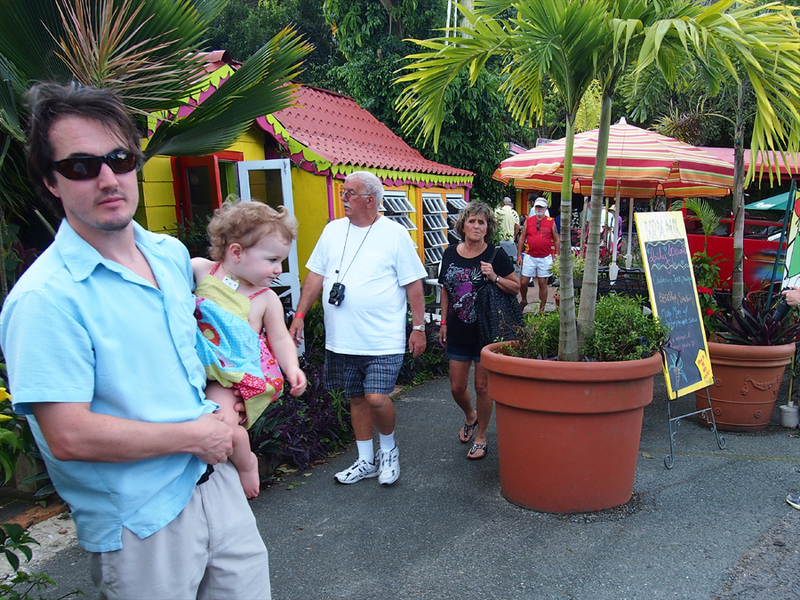 Most of the shopping is in Cruz Bay, and it’s mostly jewelry stores. They sell the stone of St. John: larimar (thought it’s mined in the Dominican Republic). It’s a lovely soft blue gem with white veining, very reminiscent of the crystal-blue ocean skirting many of the pristine beaches of the island. You’ll also see “hook” bracelets all over the place. They actually originated in St. Croix, but they have a fun story to go with them and a pleasant, simple design. The highest quality-for-cost jeweler I found was at the top of the island on the way to Coral Bay, next to Chateau Bordeaux. You’ll still pay about $100 per piece (she had booth larimar and brilliant red coral), but there’s no middle man. Plus you’re directly supporting an artist, which I always like. In Coral Bay there are hardly any shops. That said, the shop keepers there were extremely helpful and friendly, and hanging out with the locals in the circular, open-air bar and restaurant in the center of the shop complex was not to be missed. If you just want cheap clothing, bags, nicknacks, and jewelry (including plenty of larimar and coral), stop by St. Thomas’s main drag on the way to or from the airport. There’s a collection of merchant tents in the French quarter. You can’t miss it. We didn’t see them, but boy did we get bit by them. After being home for almost a week now, we were still suffering from the itchiest bites I’ve ever had. I’m not sure if the culprit was some sort of ruthless Virgin Island mosquito or the “no-see-ums” the villa owners warned us about, but these bites are not pleasant. Bring bug spray with Deet, and put it on even when you think you’re in the clear. Because you’re not. Also, bring an intense after-bite ointment to help cut down on the itching. The more you itch, the worse they’ll bother you. If you have any other questions, let me know. I’d be happy to answer what I can or at least point you in the right direction. Happy travels! 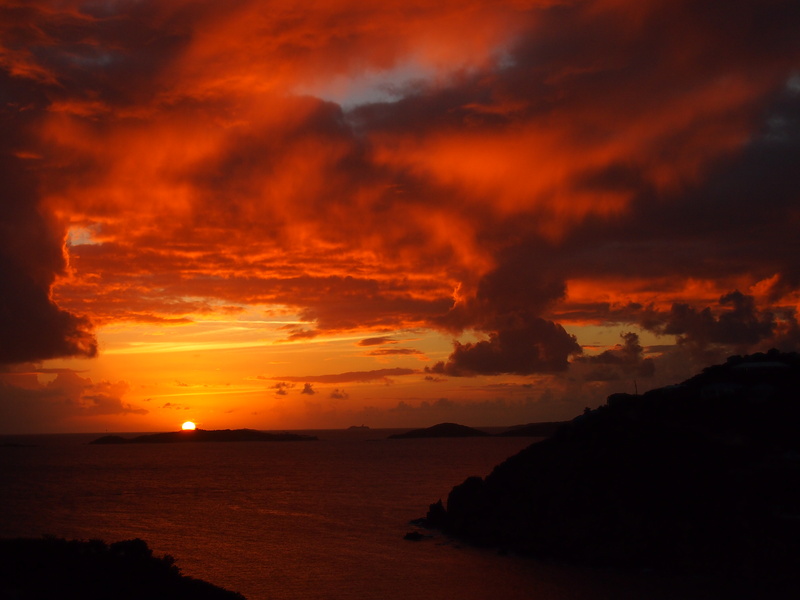 Feeling like you’re in a foreign country without all the hassle of going through immigration or changing money sounds fantastic — along with all those gorgeous beaches and that incredible sunset. Thanks for the tip about Budget Car Rental. I’m used to driving on the left side of the road, but I’ve always been in a car with the steering wheel switched, too. I wonder how I would do driving on St. Johns.